My next airplane (that I buy instead of build) will have a Rotax 915is. I'm curious to see what the changing LSA regs will look like and to see how manufacturers use an increased weight limit. The next few years should bring some new offerings from familiar players. Keep in mind BRS makes chutes for 182's and Cirrus too. Heavier plane, bigger chute. Anyone see the recent story on LSA safety in Aviation Consumer? (or Aviation Safety, can't remember which one). Virtually half of the accidents in LSA's are loss of control on the runway during landing. Article was not very kind to our CT's. I'd like to see some weight given to improving the landing gear (in my opinion the weak spot in virtually all LSA's). So - give me the 915iS Turbo for power, a bit stronger landing gear and John's requested slightly larger chute - throw in some Air Conditioning and I'm ready to write a check! (ok, maybe I just need to put on my big boy pants and fly a big boy air plane). Fun to dream... One LSA "ready to go" to higher weights is the Tecnam P2008. It's already a certified plane in the EU at that higher weight limit (P2008JC). I suspect a few of the manufacturers are busy tinkering with new configurations as we speak. I smell a new generation of LSA's with a Rotax 915iS Turbo powering them... How exciting. And on the 8th Day - God created an RV-12 Quick Build Option (these are the guys who build the SLSA version for Vans) http://synergyair.com/rv-12-quick-builds/ I may go this route for at least one of the kits (wings or fuselage). I am having fun, but its early days into the project. When the days get long, I may add a partial quick build enhancement. Looks like Quick Build adds $15k in total cost, and eliminates 100% of the sheet metal work. There is no 51% rule for E-LSA. But then again, I was doing this to learn, so the sheet metal is a big part of it. Knowing every rivet, every rib has an appeal. Had a nice breakfast with Eric (Copper City) and Walt this morning at KFUL (FUllerton, CA). Off they go on their way to AZ! My CTLSi has a new owner and home... Time to decide what's next up for me!? Tecnam P2008 Turbo? Move up to 4 seats? (Tecnam P2010, Cirrus SR22, Cessna 182) who knows - but figuring it out is half the fun for me! Adam, it’s John! The guy from NY with the fuel cart questions. Have you flown the Sling 2? They are right down from you, The Airplane Factory in Torrance, KTOA. I was also looking at the RV-12 S-LSA, but jumped to the Sling once I flew it. Im having one built now, hoping for delivery late April or May. I did a search on Tecnam Talk (their user forum) and didn't see anyone talking about speed. I'll have to ask around. I (like to) think its somewhat of a misnomer that all Sport Pilots had medical issues and thus were forced to LSA in order to remain in the air. I think the 2nd chapter of folklore was with the advent of basic med, the LSA market would dry up like a fart in the wind. I never had such medical restrictions, I was always attracted to the modern air frame and low operating costs. 4.5 GPH on MoGas sure beats 11.5 GPH on 100LL. For me it was always about mission. I don't fly coast to coast, I'm a fair weather burger chaser. I fly for fun, the joy is getting to the destination, not being at the destination (like it is for my wife). The majority of my flying is either alone or with other pilots chasing a burger on a beautiful So Cal day. I looked long and hard at new Cirrus SR20, 22, and Cessna 182's. Seemed like way too much capital and ongoing operating costs to go get a hamburger! Instead of changing my mission to fit the bigger plane, I was always looking for a way to have "new" "modern" "safe" "low operating cost" and relatively speaking "low capital costs". Some folks are "all in" and fly constantly. For me, flying is a hobby - one of many conflicting priorities. There are times I go for 2 or 3 months without flying and others when I'm up two or three times a week. 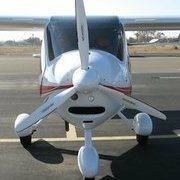 An LSA lets me fly when I want to fly, and keeps the total carrying cost low. A fully loaded Cirrus SR22 GTS goes for $750,000 right now. Contrast that with a brand new fully loaded CT at $172,000. It's a complete apple to an orange in capability, but my mission remains fair weather burger chasing - so for my world, the most cost effective remains an LSA! I have not bought anything yet. I always sell first, then buy (fear of having two planes and one hangar I suppose). After 3 CT's, I had been leaning toward a Tecnam P2008 with 914 Turbo, BRS and Garmin G3X avionics suite, just to be different. I have always loved Tecnam's fit and finish. I intend to do a little looking around before plunking down my deposit. It actually feels a tad bit liberating to have an empty hangar for awhile! Hi Roger, That is the buyer! He came over this weekend to inspect/fly, and we agreed on the price today. You'll be doing the future maintenance, and Eric will be asked to be his transition CFI / Ferry Pilot. We still have to do paperwork and all that good stuff, so it will be a few more weeks.